React-PDF: Display PDF Files in Your React App — Lets you use a ‘Document’ tag with a URL, base64 content or Uint8Array containing a PDF. Demo. A Simple Component Lifecycle Simulator — Deepen your understanding of component lifecycle by stepping through each method in slow-motion. Takeoff: A Rapid Development Environment Designed for Hack Days — Oriented around Hapi, React, React Router v4, Redux, Postgres, and NGINX. GitHub repo. 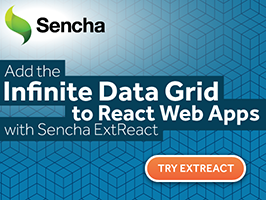 Explore the Powerful Features of the ExtReact Grid for React Web Apps — A grid can be one of the most frustrating UI components to build in React. Try ExtReact for free today and see how easy it is to add the grid and many other data-driven components like D3 charts, graphs, calendar and more, into your applications. react-imgpro: An Image Processing Component — Processes an image with filters supplied as props and returns a base64 image. The React License for Founders and CTOs — A startup founder and ex-Facebook engineer’s story of the BSD+Patents license. Free MongoDB hosting for your next app — Get started with MongoDB in minutes with our free tier, sponsored by AWS. react-idle: Notifies Your App When The User Is Idle — Provides an opportunity to do things while your app isn’t actively being used.